The summer season is nearly over, and for kids, that means one thing: Time to hit the books and head back to school! As a father, helping your son or daughter prepare for the school season can take up most of your time over the next few weeks, but before your child returns to the classroom, there are a few key lessons you should impart on preventing bullying. 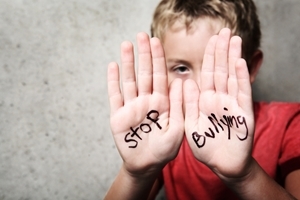 Bullying can be a serious issue at school, and whether your son or daughter is the object of abuse and harassment from a fellow youngster or merely witnesses it, with these three tips, he or she can learn how to stand up to bullies. Those who bully others look for an audience, which can make a victim feel more vulnerable and exposed. If your son or daughter witnesses abuse or harassment at school, he or she should not be a bystander, but instead should stand up for the other person. Children should never ignore a person who bullies, even if they think it's the best way to prevent a person from targeting them further. Instead, the best way to put an end to bullying can be to make others aware of it! Bullying can leave lasting emotional damage on children, but by letting your child know you're there to talk about issues that come up, you may be able to help in better ways. Sit your child down for a father and son or father and daughter heart-to-heart and encourage him or her to talk about potential bullying episodes.